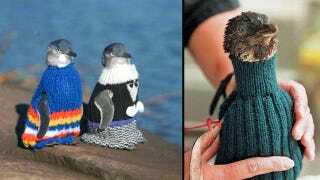 Skeinz, a yarn store in New Zealand, is calling on knitters throughout the world to knit sweaters for the penguins affected by a massive oil spill that occurred earlier this month. The tiny sweaters, while eliciting aww's and squee's, serve a very important function: they prevent the oil-soaked birds from poisoning themselves by preening, as well as keeping them warm before it's their turn to be cleaned up by cleanup workers. And, you know, who doesn't want to save the lives of penguins by dressing them in the most adorable way possible? Continue until work measures 15 cms. Decrease 1 st at each end of every row until 28 sts remain. Make second side the same. Transfer the 54 sts from both pieces to 3 of the set of 4 3.25mm needles. (18 sts on each.) and work a round neck in K1 P1 rib for 10 rows. Stitch up sides to decreasing to 27sts (opening for flipper). Add elastic to the top and bottom to prevent the penguins getting out of them. Top: 15cm of elastic; bottom 17 cm (knots allowed). Flat elastic OK.
For those of you who aren't the best at knitting, like myself (I never did get past that one scarf I started and never finished), pass this on to your animal-loving friends. Crafty folks, if you knit a sweater for the penguins — or if you've just recently finished a creation — post 'em in the comments!